IN MEMORIAM: A Tribute to Charles Rowney – It is unfathomable to think he is gone. He was an unparalleled force. 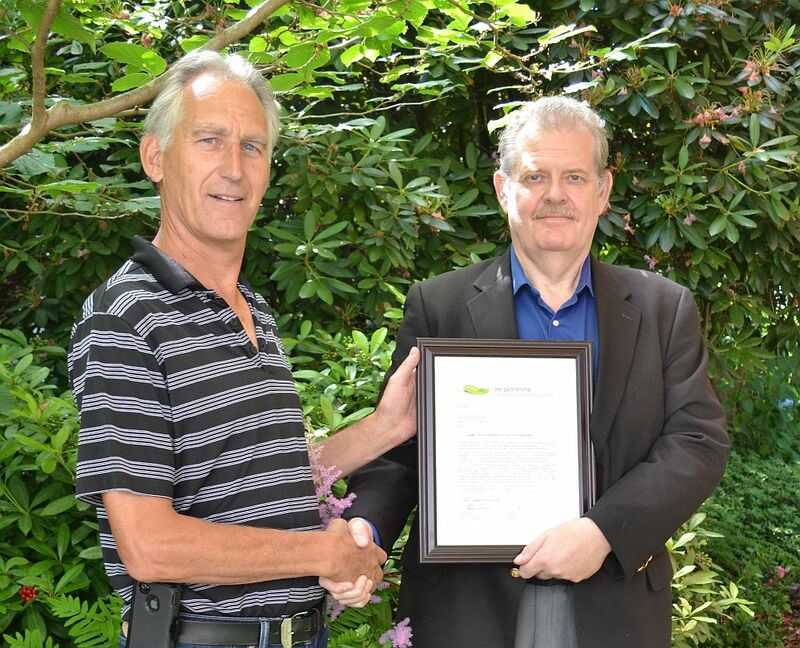 In this photo taken in June 2015, Ted van der Gulik (L), Partnership President, presented Dr. Charles Rowney (R) with a framed letter of recognition for a decade of service as the Partnership’s Scientific Authority. During the period 2005 through 2019, Charles Rowney’s commitment to the “Water Balance vision” was unwavering. Alexander Charles Rowney, BSc, BASc, MASc, Ph.D., P.Eng, D.WRE, F.EWRI, M.ASCE, was larger than life. A leader and innovator, he was a giant in the field of water resources. 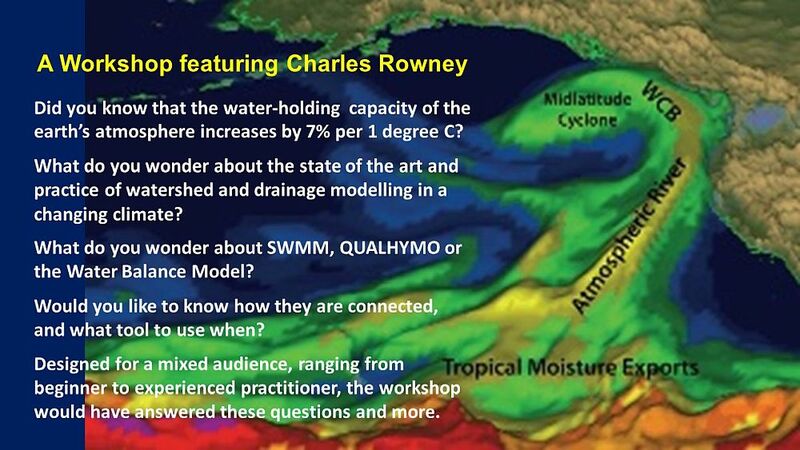 In British Columbia, the enduring legacy of Charles Rowney resides in the web-based Water Balance Model suite of modelling tools. In the United States, creation of the Center for Infrastructure Modelling and Management (ncimm.org) in 2016 was a crowning achievement in the career of Charles Rowney. As Co-Principal Investigator and Director of Operations, he was a driving force to provide sustainable research, development and outreach for water infrastructure modeling, initially focusing on the US Environmental Protection Agency’s two foremost modelling tools – known around the world by the acronyms EPA SWMM and EPANET. Charles Rowney is survived by wife Ann, sons Alex and Chris, and two grandchildren. It is unfathomable to think he is gone. He was an unparalleled force: intelligent, creative, kind, appreciative, and master of his destiny. Charles shared a vision with the Partnership for Water Sustainability in British Columbia that transcended the Water Balance tools themselves. The resulting synergy was guided by a desire to “improve where we live” and, in so doing, make a difference. It was his commitment to the mission that made Charles special to us. To say that he will be missed is an understatement. Charles was not just the Partnership’s Scientific Authority, he was our friend. Charles died only days before he was scheduled to fly from Toronto, where he was attending a conference, to Vancouver for a planning session with the Partnership. His last email communications to the Partnership dealt with the next leap forward in the evolution of the Water Balance Model, and the educational objectives for a workshop that the Partnership and the City of Vancouver were to have co-hosted in June 2019. “When moderate in scale, atmospheric rivers bring badly needed water. When larger, these rivers can cause flooding of magnitudes not witnessed before. But floods are supposed to happen. The real question is not how to eliminate them; it is how to accommodate them. Until we come to grips with where and how we build and manage our resources in the first place, we’ll find a sustainable water balance elusive and possibly not achievable. “For a long time now, the issue has not been a question of knowing how to achieve a particular watershed objective. The real problem, one we may never solve, is reaching agreement on what our objective/s should be. “Regulations and requirements based on a set of single valued targets may be convenient and even necessary, but they are also of limited efficacy and possibly counter-productive. The reality is that we are dealing with ecosystems and soft targets which are not conveniently expressed or measured. We need to find ways to express performance requirements in ways that are enforceable but also reality based. Born in Saskatoon, Saskatchewan, Charles Rowney graduated from the University of Ottawa where he obtained his undergraduate and graduate degrees and his Ph.D. under the guidance of the legendary Paul Wisner. Charles taught at Queen’s University and the Royal Military College, both in Kingston, Ontario before working in the engineering and consulting fields. In the mid-1990s he relocated to the United States. In the early 1980s, Charles developed the QUALHYMO model for the Ontario Ministry of Environment, while at the University of Ottawa. QUALHYMO is a continuous quality/quantity model with watershed, receiving stream and BMP (best management practice) components. QUALHYMO is the hydrologic calculation engine for British Columbia’s Water Balance Model. Charles had a dual background in engineering and biology that encompassed both academia and consulting. He was a Senior Research Fellow at the University of Texas at Austin, and a Board member of the Urban Watersheds Research Institute. He was active across the U.S., Canada and internationally over the last several decades. He was a model developer and user whose applications included 1D, 2D and 3D models in rural, urban, river, lake, and coastal systems as well as groundwater systems. Charles’ greatest gift was his ability to engage people and to create opportunities for those with opposing views to discuss differences and to reach consensus for collaborative action. This can be seen in the creation of the Center for Infrastructure Modelling and Management (ncimm.org) which encourages input from a diverse international community while receiving funding from the EPA. Dr. Charles Rowney lecturing – on the topic of “Drainage Modelling in the 21st Century: What we now know about what drives a successful model” – at a Water Balance Model Partners Forum hosted by the Metro Vancouver Regional District, April 2011.